OCEAN REEF UNDERWATER COMMUNICATIONS SPECIALIST Improve your communication and fun underwater with an Ocean Reef wireless communications. 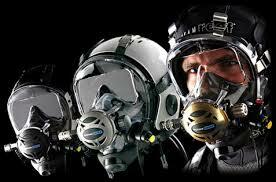 Welcome to the world of the Ocean Reef Integrated Full Face Mask, with comms. Get used to having a warm, dry face, being able to breath naturally through mouth AND nose and crystal clear, huge field of vision. Easy, natural communication with buddies and the surface will complement the use of an IDM and add to your safety and enjoyment. During a confined water session you will learn the basics of using an Ocean Reef transceiver unit alongside your Ocean Reef Integrated Mask, and check out your theoretical understanding of the equipment & procedures. Equipment considerations; you will receive maintenance and upkeep tips throughout the course. Two open water dives will complete your skill set and confidence in the use of Ocean Reef Integrated Masks Including communications. The Ocean Reef Full Face Mask & Underwater Communications courses can be integrated into one course. For all your Ocean Reef Underwater Communications course materials, contact DIVEWORLD. Ocean Reef Underwater Communications course together with Face Masks will be a huge advantage for any future courses. No matter what time of year be the guy with the warm, dry face and big grin but more than comfort the ability to share information naturally with buddies adds to dive safety and pleasure . Digital Underwater Photographers will love the ability to pass on information to each other. Sidemount and Tec diving can be made easier and safer by utilising the dual tank valve to switch tanks or gasses and never being without a 2nd stage! Imagine talking through a NOTOX gas switch as you are doing it. This specialty can be counted towards PADI Master Scuba Diver too. Ask a Scuba Expert, come in and chat to our Ocean Reef Specialty Instructors & Technicians. For more information about this or other PADI courses have a chat with one of our specialist instructors. Why not try out a mask & Comms unit before commiting, IDM try-dives available at club nights.